The Virgin Islands, part of the West Indies, are located approximately 40 miles east of Puerto Rico. The islands number more than 100 and were sighted by Christopher Columbus during his second voyage in 1493. In the following years, the European presence was fiercely resisted by the native Carib Indians. Their antipathy toward the outsiders was so great that Emperor Charles V later ordered their extermination; that enormity was completed in the early 1600s. Spain held little initial interest in colonizing the islands, but used a number of the protected harbors to shield treasure-laden ships from pirates. At different times, control in the islands was exerted by Spain, England, France, Holland and Denmark. The Danes purchased St. Croix from the French in 1733, established a permanent colony on St. Thomas in 1672 and settled St. John in 1717. Danish control of the major islands continued, except for two brief British occupations during the Napoleonic Wars, until the 20th century. The islands' economy was dependent upon sugar and cotton production by slave labor. Foreign confidence in trade with the islands was dampened by news of two major slave uprisings. However, the abolition of slavery in 1848, which eliminated the means of production, plunged the islands' even deeper into economic turmoil. Following the Civil War, inquiries were made by the United States government into purchasing the Danish West Indies, but negotiations were not completed. Construction of the Panama Canal and the rise of German naval strength induced the U.S. government to consider the islands' importance again. Word was conveyed to the Danes that if Germany gave any indication of activity in the Caribbean, the U.S. would immediately seize the Danish West Indies. That warning no doubt put the Danes into a bargaining mood and led to the negotiation of an acquisition treaty in August 1916. The Senate ratified the agreement the following year and authorized the payment of $25 million for the new possessions. 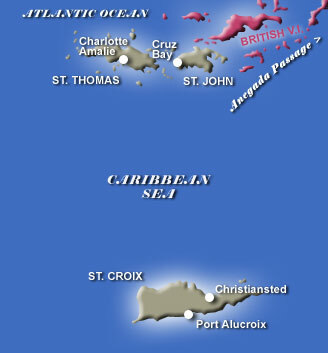 The U.S. Virgin Islands, as they came to be known, occupy a strategic location on the Anegada Passage, a prime shipping lane leading to the Panama Canal. St. Croix, St. John and St. Thomas (site of one of the best deep-water ports in the Caribbean) are the largest of the U.S. islands. See Wilson and Foreign Affairs and Acquisition of Territory by the U.S..